From the moment you enter a building, you are surrounded by top-notch art, including photographs taken by Atlanta artist Shine Huang and a Chihuly-inspired glass work by Atlanta glass artist Matt Janke. Light pours into the entry hall from the landscaped courtyard ahead with yet another work by Matt Janke as the centerpiece. A café to your right smells inviting. Did you just enter an art museum, or the foyer of a nursing home? Art museums and nursing homes do not typically have much in common. However, at Park Springs, one baby boomer is reinventing senior communities with an emphasis on legacy, feelings, relationships and a sense of home through brightly colored walls with museum-quality artwork. Who is behind the concept? Enlightened by family experience and his own research, Andy Isakson, founder of Park Springs, wants to change how we look at life in later years and how we approach our own legacy and the legacy of others. Isakson Living developed Park Springs, a continuing care community for more than 600 members who are over 55 years old, on a sprawling 67-acre campus in Stone Mountain, Georgia. Recently Park Springs built a new on-campus health center to serve the community that redefines long-term care. Art plays an important role in establishing legacy and in enhancing the community’s physical environment. Featured prominently as you walk toward the households hangs a 26-foot mural created by South Carolina artist Tarleton Blackwell, who has been cited as one of the preeminent African American contemporary artists. 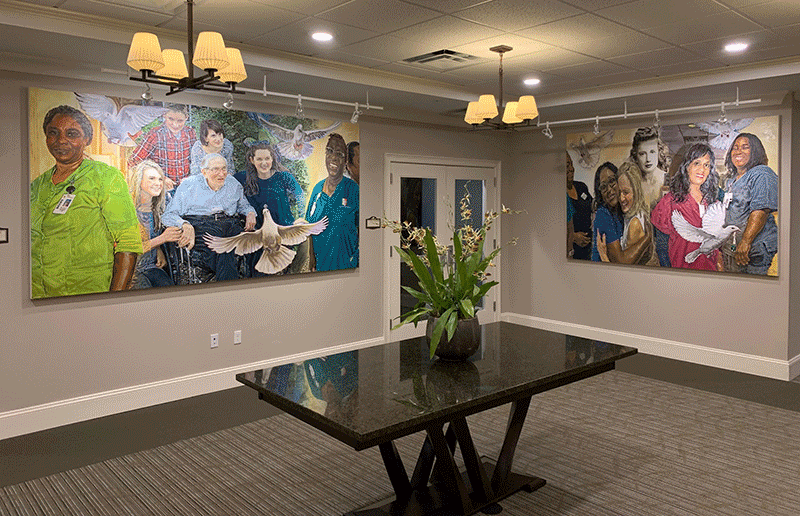 The mural “Sentinels of Legacy” was commissioned by Isakson to celebrate the commitment of the care partners and nurses who work in long term care, and the life and the legacy of the community’s members. Legacy is an important word and the portrait demonstrates how important it is in the care received by the members who call Park Springs home. The mural depicts pictures of members when they were younger, with their families, with their care partners today in long term care. The job of the care partners and nurses is to meet the member where they are today, but they need to know about the member’s life and legacy to engage them as a person and build relationships in true person-centered care. There are many wonderful relationships that develop in long-term care between members, their families and those who deliver their care. Moving in to a long-term care community can be a pivotal and emotional experience for members and their children. It is often a time of reflection on legacy, family, life and living. The “Sentinels of Legacy” mural captures this sentiment. Obviously, a deep subject, the artist did a phenomenal job with his artistic interpretation. With member input and research on best practices, Park Springs introduced to Georgia the household model of care, which sets up long term care as you would a household. Most long-term care is built with a top-down approach, but Park Springs designed the community from the bottom up. Their health was important, but not more so than the quality of their life. More than just creating inviting spaces, staff training also plays an important role in memory care at Park Springs. The community’s unique approach to memory care, the Butterfly Model of Care, focuses on individualized care that meets each member where they are in their personal journey and developing one-on-one relationships with care partners, and being surrounded by colorful and inspiring spaces has been shown to improve engagement in person’s living with dementia. This model requires significant training for staff members. U.K.-based Dementia Care Matters worked with Park Springs in its first project in the U.S. The organization’s innovative, evidenced based program for dementia care is centered on the belief that feelings matter most. Following a year of intensive training in a person-centered approach to memory care, Park Springs is introducing a new DCM program, All Care Matters, applying similar principals of relationship based, person-centered care to its skilled-care and assisted-living households. The result is a community that focuses on relationships, and many strong bonds are formed between members, their families and care partners. Isakson was moved to commission the “Sentinels of Legacy” mural to celebrate those relationships, the value of the care partner and their effect on people’s lives. For more information on Park Springs please visit www.parksprings.com and for details regarding the mural, you may visit https://www.parksprings.com/mural/.